WASHINGTON (JTA) -- There is the old joke that "denial is not just a river in Egypt." And indeed it is true. The Nile is the longest river in the world, along whose shores the Egyptian people continue their unprecedented protests, demanding an end to the Mubarak era. But denial also is the increasingly discordant notes sounded by some elements in the American Jewish community and in Israel seeking to attack and discredit the protests and lobby for a return to the pre-Jan. 25 status quo in Egypt. Continue reading JTA: "Either embrace change in Egypt or stay quiet" by APN's Lara Friedman. Continue reading APN Legislative Round-Up for the week ending January 28, 2011. Continue reading Israeli Soldiers Speak Out: Occupation and the Future of Israel's Democracy. 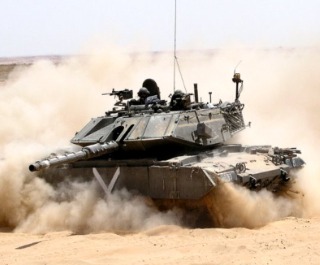 How does the emerging situation in Egypt affect Israeli and American interests? Apropos the Israeli-Palestinian peace process, now that al-Jazeera has finished revealing the "Palestine papers", how do you assess the Qatari satellite station's role? Egypt, Tunisia, Lebanon, al-Jazeera: are we witnessing some sort of coordinated attack on the forces of status quo in the Middle East? ...last week marked 50 years to the Eichmann trial in Jerusalem. In what way is this relevant today? Continue reading Hard Questions, Tough Answers with Yossi Alper - January 31, 2011. These days it seems like suddenly everyone who gets in front of the camera is presenting him-/herself as an expert on Egypt -- its history, its domestic politics, its people -- and is offering "expert" analysis about what the current developments mean and what will likely come next. Some of these people are, indeed, real experts, but many more are late-to-the-issue pundits serving up opinions and predictions that are based on a flimsy grasp of what is going on, the players, and the issues involved. For those who are looking for a political primer and some educated insights into what is happening, why it is happening, and what is likely to come next, I recommend this Q&A interview with Professor Stephen Zunes, professor of politics and chair of Middle Eastern Studies at the University of San Francisco, posted on MSNBC. 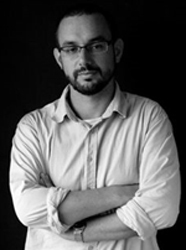 Continue reading Q&A on Developments in Egypt - Professor Stephen Zunes at MSNBC. 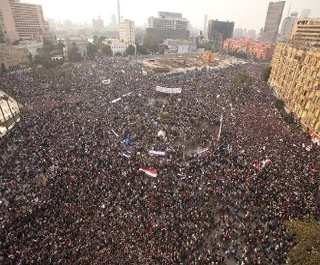 Today Egypt is undergoing historic, organic change led by the people of Egypt. The Egyptian people - not led by any single party or individual - are demonstrating through their actions that the longstanding political status quo in Egypt cannot continue. It is still unknown how these protests will end and what Egypt's government will look like in both the short-term and longer-term. What is clear, however, is that the will of the Egyptian people will not be denied, either by the Mubarak government or the international community. 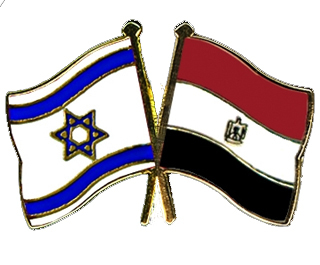 For those who view the Middle East primarily through the prism of Israel and the Israeli-Arab conflict, the developments in Egypt provoke understandably complicated feelings. Continue reading 1/29 oped on +972: Concerns about Israel mean getting on the right side of history. When Israeli government officials follow their prime minister's instruction to refrain from public statements on a certain issue, you know that the situation is serious. This has been the case over the weekends with regards to the developments in Egypt. Prime Minister Binyamin Netanyahu instructed his Cabinet ministers and other senior officials not to comment on the dramatic events unfolding across the border, at Israel's chief regional ally. And official Israel indeed is silent. Continue reading Egypt through Israel's Eyes. Well, well, well, isn't this awkward? After all that talk about Israel having "no partner" for peace, it turns out the Palestinians were ready to make a deal after all, on terms that weren't far from Israel's bottom line. Continue reading There Is a Partner, Just Read the Papers. Writer, lecturer, and social justice activist, Pogrebin is the author of ten books, a founding editor of Ms. magazine, and past president of Americans for Peace Now. "Who'd you see?" my wonky political husband asks when I return from a week of intense meetings in Tel Aviv, Jerusalem, and Ramallah. ("Intense" seems redundant in that part of the world.) Naming the Israelis and Palestinians who had met with our six-member delegation from Americans for Peace Now, I realized the astounding range of opinions we had digested in seven days. Continue reading Israel, March 2010: Vignettes and Voices. "Since my very first hours in the Oval Office, I have stated that a negotiated solution that ends the Israeli-Palestinian conflict and delivers two viable states, Israel and Palestine, living side by side in peace and with security, is a national interest of our nation. 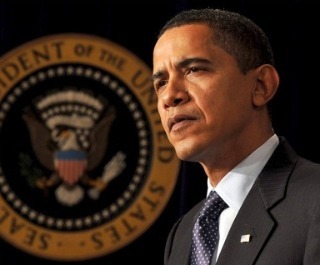 Continue reading What Obama should have said in his State of the Union address. A discussion on U.S. Middle East peace efforts moderated by APN's Lara Friedman with Steve Clemons, a leading Washington foreign policy analyst and an opinion shaper, founder and a senior fellow of the American Strategy Program at the New America Foundation and publisher of the popular political blog, The Washington Note. Continue reading Conference Call on U.S. Middle East Peace Efforts. Following is a list of short essays and articles that members of APN's Israel study tour who want to learn more about some of the issues may want to check out. None of this reading is either required or expected of the participants. It is not even to be taken as "recommended reading." It is simply a list of resources for those who seek some additional background and analysis on issues that may come up in our discussion. New book recommendation from Mark Rosenblum: The Israel-Palestine Conflict: Contested Histories by Neil Caplan. 3. Letty Cottin Pogrebin, "The Nation: 'A Visit With Salam Fayyad,'" April 5, 2010. 3. Lara Friedman and Daniel Seidemann, "Jerusalem, Settlements, and the 'Everybody Knows' Fallacy," The Middle East Channel, Foreign Policy, March 19, 2010. With less than a month until our trip, now is a good time to start following the Israeli news. Two good English language sources are Haaretz and Ynet. The APN Board recently adopted policy language on the impasse in peace negotiations. It discusses possible Palestinian moves to seek UN recognition, a topic that will likely be discussed in your meetings with Prime Minister Salam Fayyad and other Palestinian officials. Here is a backgrounder on Israel's political system prepared by APN staff and volunteers. Israel/Palestine by Alan Dowty. This newly-revised volume is very accessible and gives both points of view on the conflict. (Recommended by Mark Rosenblum, APN's founder and our tour leader). The Settlers: And the Struggle over the Meaning of Zionism by Gadi Taub. (Recommended by a trip participant). We'll be going to Silwan and Sheikh Jarrah with Hagit Ofran and Danny Seidemann. You might want to check out this article by Columbia University Professor Todd Gitlin. He writes about his recent visit to these sites with Hagit. Sign up to receive APN's weekly e-newsletter. Our website has our brand-new app with stunning in-depth views of settlement activity, as well as "Settlements 101" which is the primer on the subject. We have mailed each of you Lords of the Land by Akiva Eldar and Idith Zertal. We hope you enjoy it. Check out BitterLemons.org. Yossi Alpher, who should be familiar to those of you who read APN's Weekly Update, edits this informative periodical with his Palestinian counterpart, Ghassan Kattib. They address a single issue each week and provide commentary on it from different perspectives. JTA: "Jewish groups ask Obama not to veto settlements resolution"
Ha'aretz: "'U.K. to consider UN censure of Israel's West Bank settlements'"
Continue reading Articles on APN's position re: UN Settlement Resolution. YNET: "Settler leaders unfazed by leaked papers"
Q. Last week, David Makovsky of the Washington Institute published possible final status maps for a two-state solution with territorial swaps. A few days ago, FM Avigdor Lieberman presented a plan for an interim agreement. 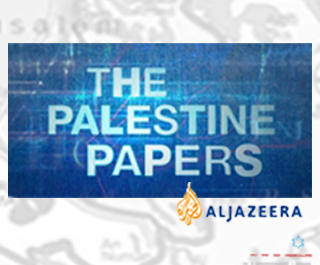 On Sunday, al-Jazeera and the Guardian revealed the PLO negotiating position on territorial issues in the 2008 talks with the Olmert government. Is there a connection? Q. The Turkel commission issued its preliminary report on the May 31 Mavi Marmara flotilla clash and the Gaza blockade leading up to it. What's your take? Q. Last week, you barely had time to comment on the split within the Labor party, when Defense Minister Ehud Barak formed (with four additional Labor MKs) "Atzmaut" and the remaining eight Labor MKs left the coalition. What's the additional fallout since then? Q. The Arab world has had some time to adjust and react to the revolutionary events in Tunisia. In what direction do the rest of the Arabs appear to be moving? Continue reading Hard Questions, Tough Answers with Yossi Alpher - January 24, 2011. "These documents -- if authentic -- highlight a reality that peace process cynics have long sought to deny: Israel has a far more real "partner" than it has ever been willing to admit." Continue reading APN: Release of "Palestine Papers" Underscores Need for Sea-Change in Peace Process. Welcome to the first Round-Up of the 112th Congress! Continue reading APN Legislative Round-Up for the Week Ending January 21, 2011. Read this compelling personal reflection which ends: "Sixty years have passed. I went halfway across the world. And now it begins again, right here in Israel." Stand for peace. Prevent U.S. veto of UN settlements resolution. A key resolution on Israel and the peace process is now before the UN Security Council. The resolution embraces negotiations, endorses the two-state solution, and condemns Israeli settlement activity. We need your help to make sure that the Obama administration doesn't veto the resolution. 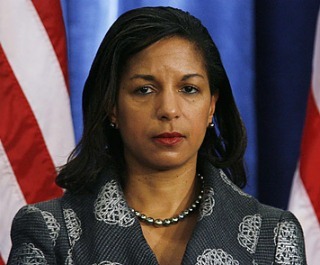 Write to Susan Rice, America's ambassador to the United Nations and a long-time friend and adviser to President Barack Obama. Continue reading Stand for peace. Prevent U.S. veto of UN settlements resolution.. The Washington Institute for Near East Policy, arguably America's most influential Middle East think tank, today published a new study examining future options for drawing borders between Israel and the future Palestinian state in the West Bank and Gaza Strip. Continue reading WINEP's New Study on Future Borders. On behalf of Americans for Peace Now, President & CEO Debra DeLee sent a letter of condolences to Israel's President Shimon Peres, who lost his wife of 65 years, Sonia. "Sonia was a noble woman, who shunned publicity, but was very active as a volunteer in her community. Rather than directing a home for disabled children, she preferred to volunteer at the institution, to feed the children and wash the floors. Together with President Peres and the people of Israel we mourn the death of Sonia Peres," said APN's Debra DeLee. 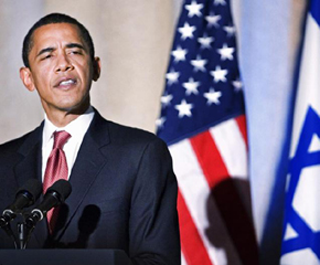 Continue reading APN to Obama: Don't Veto UN Resolution on Settlements. Jerusalem Post: "Peace Now reprimands Hasdei Me'ir tree-planting initiative"
Peace Now Secretary General Yariv Oppenheimer, sharply criticized the settler movement's tree-planting initiative to grab land around existing outposts, Army Radio reported Wednesday. "The settlers have continued to plant hatred and despair and flagrantly violate the law," Oppenheimer said, adding: "The Prime Minister and the Defense Ministry hold the responsibility for stopping this land plundering during Israel's holidays." This morning, Hasdei Me'ir, followers of the deceased Rav Kahane, announced their intention to plant 20,000 fruit trees surrounding their outposts in the West Bank. JTA: "With Stuxnet delaying Iran's bomb, is the urgency gone?" "The cyber worm may have set back Iran's nuclear program, but it is unlikely to alter its nuclear ambitions," said Ori Nir, the spokesman for Americans for Peace Now. "In order to introduce real change, the U.S. and its international allies must change the manner in which they deal with Iran and start to comprehensively engage with Tehran." Alpher responds to questions about today's news that Defense Minister Ehud Barak and four Labor colleagues are leaving the Labor party, while the remaining eight Labor MKs are apparently leaving Netanyahu's coalition. He also reflects upon last week's 'people's revolution' in Tunisia and issues in the region. Continue reading Hard Questions, Tough Answers with Yossi Alpher - January 17, 2011. Alpher reflects on the situation since Operation Cast Lead ended two years earlier, plus talks about the wave of demonstrations against foreigners in Israel. BREAKING NEWS: Alpher comments on Ehud Barak and four Labor MK's leaving the Party & remaining MK's leaving the coalition. Continue reading Hard Questions and Tough Answers with Yossi Alpher - Two Years Since "Operation Cast Lead" in Gaza. Washington, DC - Americans for Peace Now (APN) today urged President Barack Obama "to take dramatic and decisive action to reinvigorate the Israeli-Palestinian peace process." In a letter to the White House, APN argued that such US action is "the appropriate response" to the Palestinians' strategy of building international recognition for an independent Palestinian state. The letter was signed by APN's Chairman of the Board Martin I. Bresler and the organization's President and CEO Debra DeLee. 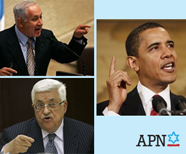 Continue reading APN to Obama: Respond to Palestinian Recognition Efforts; Reinvigorate Peace Process . This statement is part of a larger policy document, which can be viewed here. With the steady march of settlements, the rightward shift in Israeli politics, the fragmentation of Palestinian governance, and the growing sense that a conflict-ending peace agreement is impossible, some are ready to declare the death of the two-state solution as a means of ending the Israeli-Palestinian conflict. But a review of the "alternatives" reminds us of the painful truth: there is no alternative to the two-state solution. Continue reading No Alternative to the Two-State Solution. The current crisis offers President Obama the opportunity to turn his peace policy around. The fact is, there is already a longstanding and broadly-based consensus on most of the elements of a permanent status agreement - what is needed is a process to bring the sides together and the leadership and political will to get them to come to an agreement. Continue reading APN on the Way Forward. The lack of progress in peace efforts has produced a growing sense among Palestinians and in the international community - including in parts of the American Jewish community - that the time has come for the Palestinians to force the issue by seeking international recognition of their State. The Palestinian move to seek international recognition of a state of Palestine, even under occupation, reflects not only frustration with the pace of peace efforts but an understandable desperation - a recognition that the situation is nearing a tipping point where developments on the ground in the West Bank and East Jerusalem, in particular settlements and settlement-related infrastructure - will soon make the two-state solution impossible. APN has consistently opposed unilateral actions - by either side - that undermine efforts to reach a negotiated, two-state solution. For this reason, we have opposed Israeli settlement activity in the West Bank and East Jerusalem and we criticized Israel's disengagement from Gaza (because it was unilateral and ultimately undermined Palestinian moderates and empowered Hamas). Likewise, we have consistently condemned Palestinian violence and incitement, including statements that dismiss Jewish historic/religious claims to Jerusalem. Unilateral actions, by either side, will never be a substitute for negotiations or resolve the conflict - something that the Palestinian leadership itself has recognized even in the context of this effort. It is the Palestinians' right to seek international recognition of a state of Palestine, even under Israeli occupation - and it is a strategy that is showing results, in terms of both early, limited success in the international community and the strong Israeli reaction to this success. But we fear the Palestinians are embarking on a perilous course. Even as this strategy puts pressure on Israel, it could also become a pretext for Israel to once again declare that it has no partner for peace, turn its back on negotiations, and accelerate its own unilateral actions on the ground that hasten the demise of the two-state solution. Moreover, the campaign for recognition risks unintentionally strengthening rejectionists on both sides - Palestinians and Israelis alike who oppose peace negotiations and a two-state solution, and who would welcome confrontation and violence as a means of closing the door to both. The correct response to the Palestinians' quest for recognition is the acknowledgment that this development reflects, understandably, a loss of faith in a negotiated settlement and a determination to gain leverage through non-violent means. What flows from this is the recognition that U.S. demands that the Palestinians desist from this effort will be irrelevant until such time as a credible negotiating process is re-established. Courageous U.S. leadership is vital to restore faith in the belief that negotiations will deliver a two-state solution in the near term. This will require a level of resolve that the Obama Administration has failed to demonstrate thus far, including imposing consequences on any party that acts in ways that undermine peace efforts. The Obama Administration has the ability to impose real costs - diplomatic, economic, and political - on the parties, both with and without Congressional approval. The Obama Administration must make a comprehensive assessment of these options, and make clear to the parties that it is ready to use this leverage, if required. Following is policy language that has been newly adopted by the APN board. The achievement of a negotiated solution that ends the Israeli-Palestinian conflict and delivers two viable states, Israel and Palestine, living side-by-side in peace and with security, is the central goal of Peace Now in Israel and of Americans for Peace Now (APN). The urgency of the Israeli-Palestinian situation today cannot be overstated. The current status quo is fragile and wholly unsustainable. The peace process is at an impasse. Settlement construction continues. Violence and tensions on the ground are rising. With the immediate concerns of growing instability in Gaza and predicted instability in Lebanon, Israelis and Palestinians alike are again talking about impending war. Dramatic and decisive action by the Obama administration is vital to stop the deterioration and provide a way forward. Continue reading APN on the Current Impasse in Israeli-Palestinian Peace Efforts. Ha'aretz: "Court petitioners may be forced to reveal funding sources"
Continue reading Ha'aretz: "Court petitioners may be forced to reveal funding sources". Ma'ariv: "Outcry of the Left" & YNET: "Leftists: Lieberman's comments only spur us on"
Peace Now Secretary General Yariv Oppenheimer, one of the leading figures behind setting up the coalition... "This is a time of emergency not only for left wingers, but for everyone who is concerned about Israeli democracy and the freedom to think and voice opinions." Continue reading Ma'ariv: "Outcry of the Left" & YNET: "Leftists: Lieberman's comments only spur us on". 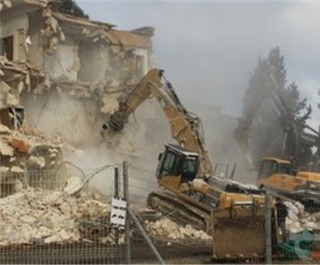 Washington, DC - Americans for Peace Now (APN) today condemned the settlers' move to demolish the Shepherds Hotel in the East Jerusalem neighborhood of Sheikh Jarrah. The demolition makes way for the first settlement construction in this Palestinian neighborhood since 1967, and dovetails with intensive efforts by settlers to target this neighborhood through evictions of Palestinian residents and takeover of their homes. Continue reading APN Condemns Demolition of Shepherds Hotel; Urges Obama Administration to Intervene Urgently on East Jerusalem . After a tumultuous and highly vocal deliberation, the Knesset has voted, by a large majority, to establish a parliamentary commission of inquiry to investigate the activity of leftist organizations aimed against IDF soldiers. Ha'aretz: "Leftist groups: 'Witch hunt' against us will destroy democracy in Israel"
JTA: "Rethink probe of groups, AJC urges Knesset"
YNET: "MK Ben-Ari: Eradicate treacherous leftists"
YNET: "Machsom Watch: Probe MK Ben-Ari for incitement"
Continue reading Articles on Knesset Commission Investigating 'leftist' organizations. Ha'aretz: "Clinton: 'Shepherd Hotel demolition undermines peace'"
Israel begins razing East Jerusalem landmark -- Shepherd Hotel in Sheikh Jarrah neighborhood -- to make room for 20 housing units designated for Jews. Peace Now: "Extreme right taking over east Jerusalem like thieves in the night"
Continue reading Ha'aretz: "Clinton: 'Shepherd Hotel demolition undermines peace'". Knesset Member Michael Ben-Ari suggested last week that those who support organizations like Peace Now are "the greatest Israel haters" and to threaten that the Knesset will pass a law to "eradicate" peace groups and to target their funding. "Such a germ can destroy Israeli society," he said. Write Secretary of State Hillary Clinton. Tell her to put Israel on notice that America is concerned about the deterioration of democracy. Continue reading Defend Israel's peace and human rights groups. Americans for Peace Now (APN) today condemned the settlers' move to demolish the Shepherds Hotel in the East Jerusalem neighborhood of Sheikh Jarrah. The demolition makes way for the first settlement construction in this Palestinian neighborhood since 1967, and dovetails with intensive efforts by settlers to target this neighborhood through evictions of Palestinian residents and takeover of their homes. It also parallels growing confrontations in Silwan and harassment of Silwan's residents to accommodate a growing stream of settlers into this East Jerusalem Palestinian neighborhood. All these developments are part of a concerted settler campaign, abetted by the Israeli government and Jerusalem municipality, to expand and consolidate their hold on the neighborhood at the expense of its Palestinian residents. Continue reading APN Condemns Demolition of Shepherd's Hotel: Urges Obama Administration to Intervene Urgently on East Jerusalem. Ha'aretz: "'Dangerous' political websites blocked from viewing at Israel's airport"
Ben Gurion International Airport's wireless service reportedly is blocking travelers from selected left- and right-wing political websites, including that of Peace Now. (UPDATE: changes have been made and as of January 12, the Peace Now website is available for viewing at the airport) Peace Now's Yariv Oppenheimer: "It's regrettable that people leaving Israel should be made to feel as though they were leaving China or North Korea. Only backward countries bar Internet sites expressing political opinions." Also see excerpts and links to: JTA: "Ben Gurion Airport blocking political websites" AFP: "Israel airport wifi blocks political sites"
Continue reading Ha'aretz: "'Dangerous' political websites blocked from viewing at Israel's airport". Alpher responds to questions about the possible Knesset committee to investigate the funding sources of left-wing NGOs like Peace Now; former Mossad head Meir Dagan's series of extremely conservative estimates regarding Iran's nuclear program; unusual escalation in Israeli military activity in the West Bank last week. Continue reading Hard Questions, Tough Answers with Yossi Alper - January 10, 2011. Today APN sent the following letter to the leaders of the Conference of Presidents of Major Jewish Organizations - an umbrella organization that includes representatives of 52 Jewish organizations (including APN). This has been a terrible week for Israeli democracy. The Israeli Knesset voted to investigate funding of "left-wing" groups, in what can only be described as a politically-motivated witch hunt. An Israeli Knesset member, Michael Ben-Ari, was subsequently caught on tape inciting against Peace Now and other progressive groups, going so far as to call them "germs," calling their supporters "the greatest Israel haters," and threatening to pass a law "to eradicate this dangerous enemy." And in an almost Orwellian twist, it was revealed that the Israel Airports Authority is blocking Peace Now's website - and those of other organizations deemed to be "dangerous" - at Ben Gurion Airport. On behalf of the tens of thousands of people who support APN and who, through us, support Israel's Peace Now movement, we are outraged and sickened by these attacks. Peace Now, as well as other organizations Ben-Ari and those like him are attacking, are an essential component of Israeli democracy. 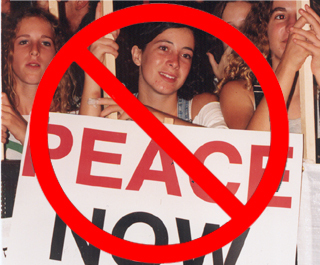 American supporters of APN and Peace Now are among Israel's truest friends. Continue reading APN Calls on Conference of Presidents to Denounce Knesset Witch Hunt. Knesset Speaker Ruby Rivlin: Investigation of NGOs will be "show trial"
"...We need a commission of inquiry to reevaluate the subversive political activity of David Ben-Gurion and Natan Alterman. Alterman wrote a poem during the War of Independence, the toughest war in Israel's history, in which he accused the IDF soldiers of committing war crimes, and proposed executions of offenders ("For this"). Ben-Gurion, as a traitorous defense minister, instructed that this poem be sent to all IDF soldiers, thereby damaging Israel's reputation and undermining their confidence in its morality. They served Israel's enemies knowingly in time of war. The commission of inquiry can discuss the matter and recommend, let's say, that the writings of the traitors be burned and the name of Ben-Gurion Boulevard be changed to Kirschenbaum Boulevard [LF: for Faina Kirschenbaum, the member of Knesset from the Yisrael Beiteinu party - and settler - who introduced legislation to establish a commission of inquiry into "left-wing" groups]...."
Translation by Israel News Today. Links added by me. Continue reading Ma'ariv Satire: Investigate David Ben-Gurion & Natan Alterman. Continue reading We Will Not Be Silenced!. Continue reading We Will Not be Silenced. Last week, Israel's top diplomats gathered in Jerusalem. Many flew in from across the world. They traded in their suits for black t-shirts and their diplomatic niceties for loud whistles. The senior diplomats were protesting their low wages and poor working conditions. The black t-shirts said "I am a poor diplomat." Indeed, Israel's foreign-service professionals have a point. Their salaries have eroded by some 45 percent in recent years. Continue reading Peace is the Answer to Israel's Isolation . In response to criticism over yesterday's Knesset decision to investigate "left-wing" groups in Israel, Israeli Deputy Foreign Minister Danny Ayalon - often the leading edge of Israeli hasbara efforts to the English-speaking world - wrote/tweeted the question "who's afraid of transparency?" Coincidentally - or not - one of the Israeli Right's most loyal voices in the U.S. had tweeted hours earlier, "When a simple transparency bill is being denounced as McCarthyism, you know the NGOs have something to hide." This hasbara effort is so ham-handed it almost defies belief. It comes on the heels of last weekend's stunningly inept (and wholly ineffective and ultimately counterproductive) hasbara effort trying to convince the world that, even without any investigation, Israel had determined that it bears not even the tiniest responsibility for the death of Jawaher Abu Rahmah of Bili'in. Now, days later, Israeli officialdom - which eagerly threw out all sorts of ugly rumors that demonstrated nothing more than a total disregard for the dead and her loved ones - has had to back off its accusations and innuendo. Given this very recent failure, you might think that the "Israel-right-or-wrong" folks (in Israel and the U.S.) would have considered their strategy carefully before jumping to the defense of this latest Knesset action. But apparently they didn't. Continue reading Hasbara Can't Kosher Anti-NGO Witch-Hunt [Updated]. The quote of the day goes to Israel's Knesset Member Benny Begin, a Likud hawk but a liberal democrat, who is a minister without portfolio in Binyamin Netanyahu's cabinet. In an interview with Israel Radio, Begin said: "It is dark here." He was referring to yesterday's Knesset vote (not a final vote, thankfully) to investigate the funding sources of human rights organizations. The Knesset bill, by the way, for the first time explicitly singles out "left wing" organizations. Continue reading "It is Dark Here" . Do You Want to Intern at APN this Spring? Are you passionate about achieving Middle East Peace? Are you ready to take your activism to the next level? Are you a college student who is looking to get some work experience? Maybe you should apply for an internship at Americans for Peace Now. Continue reading Do You Want to Intern at APN this Spring?. Israel's Channel 2 TV news magazine recently aired a special segment documenting their tour of the West Bank with by Peace Now. See the video (below with English subtitles) that was broadcast throughout Israel. It highlights realities of life in the West Bank and demonstrates Peace Now's ability to make its case against settlements directly to the Israeli public. Alpher answers questions about the strategic outlook for Israel in 2011. Continue reading Hard Questions and Tough Answers with Yossi Alpher- January 3, 2011. Former Israeli Knesset Member and secretary general of Peace Now was attacked by an Israeli policeman and then arrested Saturday night at a demonstration in Tel Aviv. Mossi and other peace activists were protesting against the IDF's use of excessive force in the West Bank. He spoke with APN about the reason for the demonstration, about the circumstances of his arrest, and about the struggle to protect Israeli democracy. Continue reading Interview with Mossi Raz after Demonstration Arrest .